As part of the MECS commitment to community outreach, this week we partnered with Montgomery Public Schools to provide funding, state-of-the-art equipment donations, and technology programming to the students of Carr Middle School. The financial contributions will go towards investments in electronics, technology, and computer science education. We provided two 4-K digital display boards, a total value of over $6000, with the inspiration to build a tech-forward environment for students and faculty alike. Our experienced team members installed the boards and spent the morning teaching fundamentals of engineering and computational skills, as an extension of our Kids in Technology initiative. 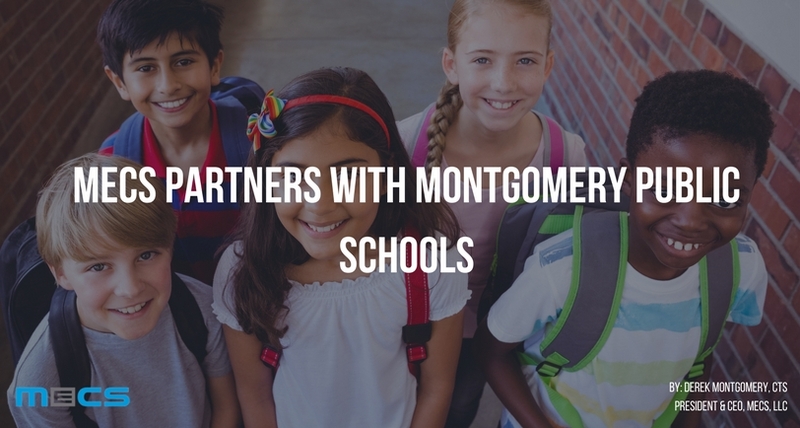 The KIT program is already in place across several schools in the Montgomery area. “This initiative is just a small part of what American children need in order to have the confidence to enter a globally competitive technology industry,” shares MECS founder Derek Montgomery. Since founding MECS in 2004, Derek and his team of solution engineers have set out to make an impact on their clients’ businesses and their community, even enlisting the help of their manufacturer and vendor partners to donate marketing dollars and equipment to the KIT program.